• What is the market share of the leading players in the global AML software market for 2016? Over the past few years, the financial service industry has witnessed a far-reaching technology-led modifications, with companies looking for improving the efficiency of their financing departments by incorporating innovative IT solutions. In addition, customers have set their expectations and are demanding added worth for their money, along with seamless experience and better services. The banking software industry, in particular, is filled with a range of activities, which are utilizing resources to create value and benefit society, globally, in terms of understanding, exploring, researching, managing, and utilizing financial services. It is expected that in the next decade, the banking industry will witness both revolution and evolution, in terms of facilitating global, multi-service, low-cost, and digital banking. However, with the growth in the banking software industry, there is an increasing demand of regulators to counter the upsurge in financing of terrorism and money laundering incidences. On-premise deployment type contributed the largest share to the AML software market in 2016, owing to high level of consumer data security provided as compared to cloud deployment. However, cloud deployment is expected to witness the highest growth rate during the forecast period. This delivery model requires monthly or yearly subscriptions which are cheaper as compared to on-premise deployment software. The widespread adoption of cloud based delivery model will be witnessed in future due to the low entry cost as compared to on-premise deployment model. The cloud based deployment model involves the combination of cloud computing with wireless sensor networking, and mobile computing to automatically provide the users with the required data. Transaction monitoring software had the highest penetration rate in the overall AML software market in 2016, followed by currency transaction reporting, customer identity management, compliance management software, and others. 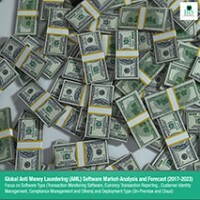 Transaction monitoring software accounted for highest market share in the AML software market for the year 2016, owing to generate full-fledged analysis of a customer, thereby facilitating prediction of risk levels and future money laundering activities, along with providing reports and creating alerts for suspicious activities. The North American region dominated the AML software market in the year 2016 and will continue to dominate the market, owing to stricter customer identification regulations and compliance for the financial institutions in order to reduce money laundering activities. The Asia Pacific region is expected to foster the highest growth rate in the market during the period, 2017-2023. The factors such as increasing regulatory compliance, adoption of stringent AML regulations, and adoption of the software in various institutions are the major reasons for the constant growth of the AML software market in the region.